SkyNetHosting.Net provides ClientExec FREE with most of our Resellers Hosting Plans. ClientExec is a software that help web hosts to manage and support their clients efficiently. Top features include powerful customer management, account creation automation, recurring invoicing, server monitoring, integrated helpdesk and tons of 3rd party payment processor support, including Authorize.net and PayPal. Signup Any Of our 8 Year Anniversary Reseller Plans and Get ClientExec or WHMCS Billing Software for absolutely FREE! 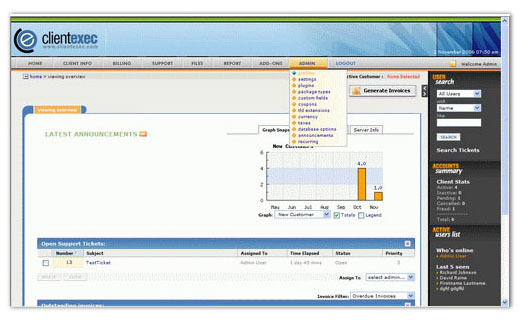 We no longer offer ClientExec with our reseller plans, instead we offer WHMCS which has more features than ClientExec. WHMCS is one of the most popular billing & support solutions with web hosts and developers.